NAMM 2017: DOD Electronics, the original boutique pedal brand so ably resuscitated by Digitech/Harman in recent years, has dropped a trio of stompboxes at NAMM this year: a promising analogue delay pedal, plus mini expression and volume boxes. Rubberneck is undoubtedly the main event, an analogue delay with features galore, including independent control of rate and depth of modulation, as well as double footswitches allowing control of 'extended features'. For more details on those read on and examine DOD's admirably clear breakdown image below. 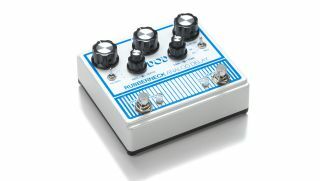 Rubberneck is on sale now at a US MSRP of $429.95. Flanking Rubberneck at the show are the new Mini Expression and Mini Volume pedals, which do exactly what you'd expect, offering space-saving options for volume and expression control. Both the Minis are on sale now at $149.95. Double footswitches allow for unique extended features like user customizable momentary control of oscillation and momentary control of the dizzying pitch sweep of "Rubbernecking." These extended features are controlled by individual clear mini knobs that double as multi-color LED status indicators. Feedback loop send/return, remote footswitch control, true bypass, and rugged metal construction, make the Rubberneck Analog Delay the must have delay of the year.